Master the art of making a basic white sauce. Correctly made it will have a smooth and velvety texture. It is good to have the know how to make these basic sauces as you can prepare a number of other sauces just by adding a few simple ingredients. Melt butter in a large skillet or sauce pan over low heat. Blend in flour, salt and pepper. Stirring constantly, cook over low heat until smooth and bubbly. Remove from heat and stir in milk. Heat to a soft boil, stirring constantly and watch closely not to scald the milk. Boil and stir for 1 minute. This is a thin version. 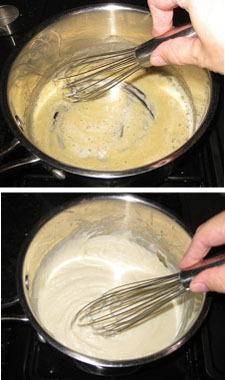 To make this sauce thickened, increase the Butter and Flour amounts. For Medium thickness, increase butter and flour to 2 Tbls, for a Thick sauce increase both to 1/4 cup. Quick Ideas: Stir 2 cups of a vegetable into the white sauce for creamed vegetable dish or you can Add a tsp mustard and 4 oz shredded cheddar cheese and you have a cheese sauce for easy vegetable recipes. A rich, hot butter sauce made with a reduction of white wine and shallots into which cold, whole butter is blended in over low heat to prevent separation. It is optional to add a couple tablespoons of cream as a stabilizing agent to the shallots and wine once they have reduced. In a large saute pan, place shallots and white wine over medium-low heat and reduce until the wine is almost evaporated, taking care not to let it brown. Add the butter one piece at a time, whisking constantly until the butter is melted and incorporated into the sauce. Add salt and white pepper to taste. Add lemon. Velouté sauce is basically a White Sauce made with stock instead of milk. Melt butter in sauce pan over low heat. Blend in flour, cook stirring for 2 minutes. Remove from heat and stir in broth, whisking briskly to blend. Over medium heat bring to a soft boil, stirring with the whisk for 1 minute. Add seasonings. Use as is or enrich by gradually beating in cream and simmer 3-5 minutes. Strain with a fine mesh strainer Add lemon juice to taste. Sauce made with chicken stock should ideally be served with chicken and likewise, a sauce made from fish stock should be served with fish. 1. Add to the roux 2-3 Tbl tomato puree and at the end add finely chopped tomatoes. 2. Add 3 Tbl lemon juice and 2 Tbl chopped fresh parsley to the sauce before serving. 3. Add 7 fluid ounces fresh squeezed orange juice after the stock has been added to the roux. 4. Thickened with heavy cream, egg yolks, and season with a few drops of lemon juice.